You know those cute handbags you see at Anthropologie? They're usually all Hayden-Harnett. 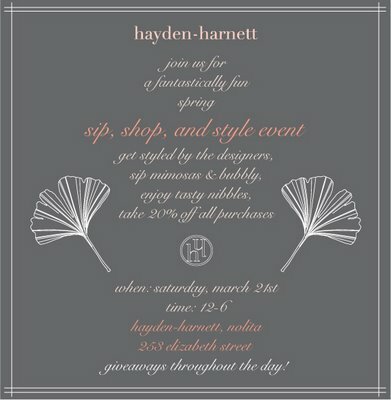 So anywho, if you visit their store tomorrow during this shopping event, you'll receive 20% off your purchases. Beverly and I might have to stop by. We've been in the market for a new handbag ever since our last one got ruined. UPDATE: Ooh, look! They have a shoe line now, too!